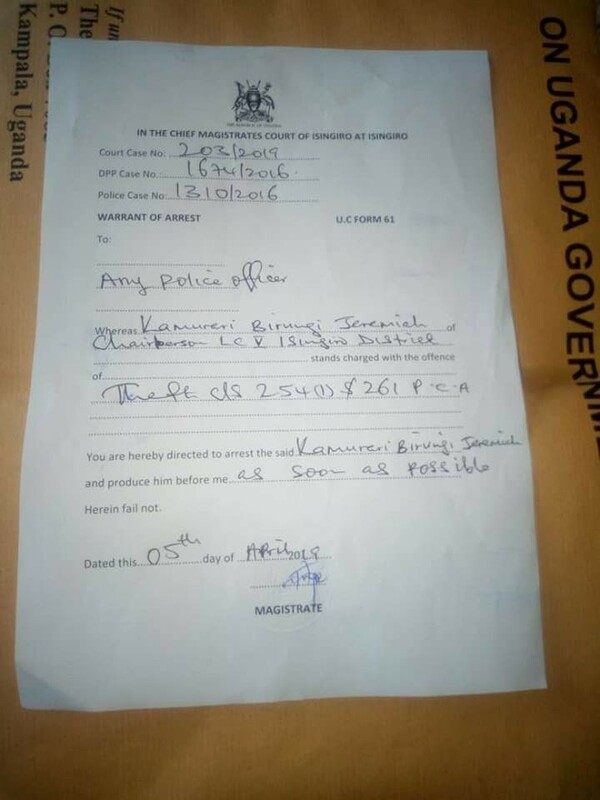 ISINGIRO – All is not well for embattled Jeremiah Birungi Kamurari, the Isingiro District chairman after the Isingiro magistrate grade one issued four warrants of arrest to have him produced in court to answer various charges. The Friday, April 5, come after Mr.Kamurari refused to appear in court two times which court termed as contempt of court, leaving it with no option but to issue warrants of arrest. Grade one magistrate for Isingiro District, Nazario Murangira issued the warrants. “Whereas Kamurari Jeremiah, the LCV chairman for Isingiro stands to be charged with these counts, criminal tress pass, contrary to section 302(a) of the Penal Code Act, Common assault contrary to section 235 of the Penal Code Act, Theft contrary to 254(i) and 261 of the Penal Code Act, you are here by directed to arrest the said person and produce him before me, ” the warrant reads, in part. Mr. Kamurari is to answer charges which include malicious damages according to the warrant of arrest on police and court case numbers CRB 1429/2017 and 202/2019 respectively. Sources privy to this information from the office of the resident state attorney, have intimated that so far Mr. Kamurari has other 14 files which have been sanctioned by the Director of Public Prosecution awaiting to be taken to court. Other sources add that right now Mr. Kamurari is in hiding in Tanzania where he allegedly went for burial of one of his relatives.